You are currently browsing the tag archive for the ‘pet painting’ tag. 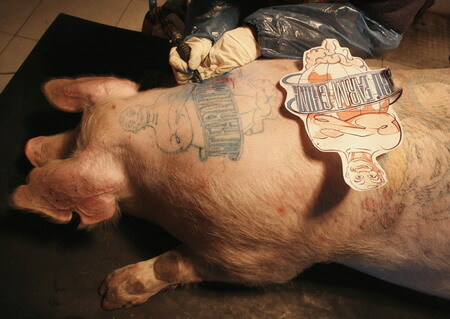 porcine art- todays news about tattooing pigs with artwork ? This is a watercolour by PAT WEAVER, of Dade City, Florida. Its fairly similar to the kind of work Portrait Xpress Artists do as comissions of pets, from a photo. This is art, and I like it. What comes below- really, this ain’t art. I heard today about something very strange…. “pet art” by a Belgian Artist in China. Belgian conceptual artist Wim Delvoye currently (Nov 08) employs workers to tattoo pigs in an “Art Farm” at the outskirts of Beijing, China. Delvoye has staff consisting of local farmers to raise the pigs.. and professionals to tattoo them with cartoons or symbols. 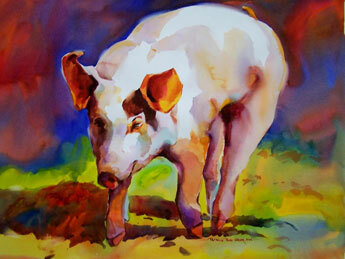 The pigs would then be displayed at art exhibitions and their skins sold to collectors after they were slaughtered. Very wierd, and actually I dont like it- putting a tattoo on a live animal has got to hurt, and even if they are sedated, it seems pretty cruel. From a veterinary perspective, this seems very unnecessary and quite sick. Any comments? okay… Im hooked on the pug theme, here is some more!! Not ‘proper art’ but lets not be so stuffy eh! Now don’t tell me you didn’t enjoy the soundtrack to the video, 90’s Euro-Pop is great! See the first post I wrote about pugs for more sensible pug news and pug artwork! Oh, and is it pugnatious or pugnacious, or are both ok? please comment! Hello everyone! As you know, as well as having great fun running my bespoke artwork site www.portraitxpress.com, (selling paintings of pets and people copied by hand from your photos), Im also a veterinarian day to day ocassionally- this was what I spent 5 years at University in England training to become. So, today I want to talk a bit about my work as a veterinarian. Lots of problems that pets get are because of silly things that their owners do, much like as in the world most of the problems are created by humans, fighting and killing each other and starting wars and so on and so forth. Well, with pets its a similar story im afraid. In the wild, animals tend to eat certain foods, depending on what type of animals they are. Carnivores like dogs tend to mainly eat meat (I guess a wild dog example could be something like a wolf or a jackal?). Anyway, they must eat meat, and scavenge for other things. Certainly they dont have a luxury diet. Anyway, as pets, as well as eating dog food, lots of people like to give dogs treats also. One thing people give is rice (which I dont think wild dogs would eat much of?!!!!). Here is a painting of someone’s dog, just as a sideline!! Okay, so eating Rice, NOT GOOD. Why? Well, it makes your urine a bit alkaline and then this pre-disposes dogs to getting STONES in the bladder. Obviously thats uncomfortable, and so then the dogs have a problem going to the toilet. Owch!! So, as with all of life- practice balance in all things!! Don’t give your pet too much HUMAN FOOD ie food for people, as otherwise by mistake you could give it a few medical problems. Have a great day! Matt. Sorry for the self- promotion, I’m British so I’m not good at it! But I want to shout out how Portrait Xpress has been working with charities this year! In November 2008 we will help sponsor ‘Peak to Fong’ an event by Hong Kong Dog Rescue charity, in Hong Kong. Portrait Xpress are proud to be donating gift vouchers for a personalised pet painting worth 1000 HK Dollars for the winning dog/owner who makes it down from the Peak of Hong Kong, to Lan Kwai Fong in Central. And 5 x $100 vouchers to the 5 runners up! Portrait xpress are running a new pet painting campaign for winter 08 and throughout all of 2009! Our pet paintings are now displayed in a number of Pet shops in Hong Kong, and also many London (UK) Veterinary Clinics. We really want to brighten up gloomy vet clinics so that the animals all get better! What is better to do this than with a bright fresh pet painting of your favourite pet?!! Paintings are each unique hand-copies of client’s pet PHOTOS. The Paintings are fun and colourful and the client can choose to customise them in many ways.